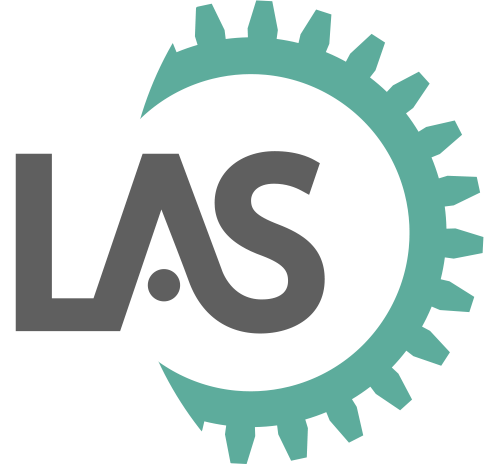 LAS partnered with leading bookseller, Waterstones, to create an award-winning goal-based learning system, Waterstones Academy. The Academy is now delivering a range of training, including a university-accredited Bookseller Qualification, to ensure that Waterstones’ people are best equipped to deal with the rapid pace of change in their industry. Waterstones USP is having knowledgeable booksellers who are able to offer passionate and informed recommendations and advice to customers. With the introduction of the Kindle as a product range, there was a need to train booksellers on how to operate and sell these new devices, so that they could offer the best possible service to customers. In addition, Waterstones wanted a system which could be built upon to include induction, career progression, ongoing training and a simple performance review process. There were a range of challenges with this project; timescales were very short, users had a range of technical ability and access to PCs was limited in-store as staff need to be on the shop floor for most of the day. In terms of the system itself, Waterstones wanted the site to behave differently for different people or people at different stages of their career. They wanted to be able to set timescales for completing goals and to have a facility for learners to allow their line managers to review what they had done. The goals needed to include text, images, videos, podcasts, quizzes and assignments and have a star rating system. 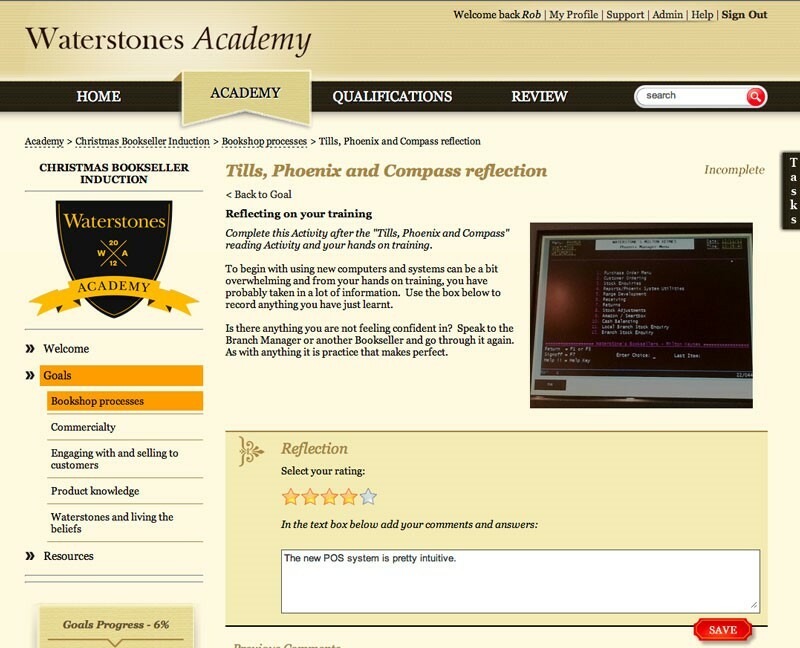 Waterstones also wanted to be able to create and edit the content themselves. The site needed to work cross-platform and also the design needed to have the Wow factor. We created a goal-based learning system with a number of ‘shields’ (subjects) that Booksellers and other Waterstones employees could attempt. They work towards attaining a shield by choosing goals to achieve and then completing a range of real-world activities, to be done within their work environment. We also included embedded quizzes and surveys using a third party tool, to reinforce their learning. The line manager review process was designed to be as simple and straightforward as possible, so that it could be used regularly to support continuous improvement in learners. Waterstones are able to administer users and create content themselves, giving them full control of the system. 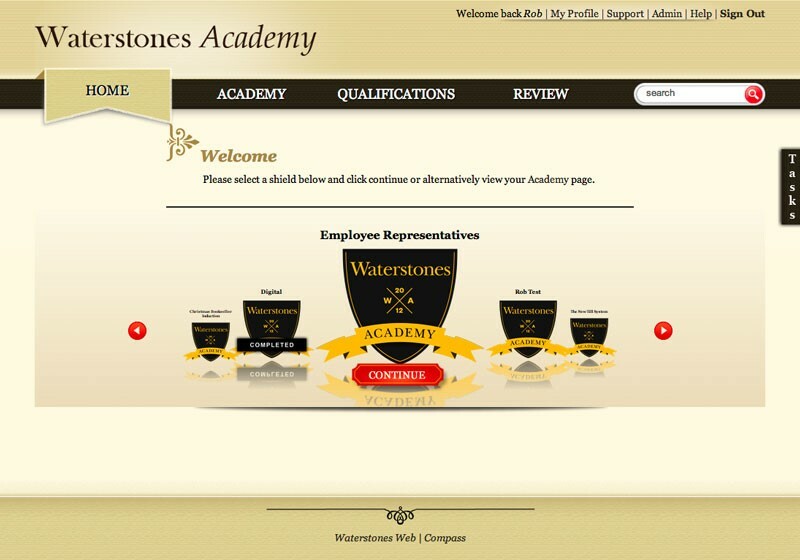 Waterstones Academy is now being used throughout the business to deliver a range of training, including their university-accredited Bookseller Qualification. Aligning the system closely to organisational strategy and involving end users from the start has ensured high levels of adoption. Real-world activities ensure that the learning translates well to the shop floor with 91% of users reporting that they have applied what they have learned to their work, increasing sales as a result. Waterstones is one of the leading booksellers on the high street and online. They first opened in London, in 1982 and currently trade from nearly 300 shops in the UK and Europe. Waterstones reputation is built upon the knowledge and enthusiasm of their 4,500 booksellers. An average sized Waterstones bookshop merchandises a range of around 30,000 individual books, with the largest shop stocking over 200,000. The expert recommendations and advice of the company's booksellers are key ingredients in its success.